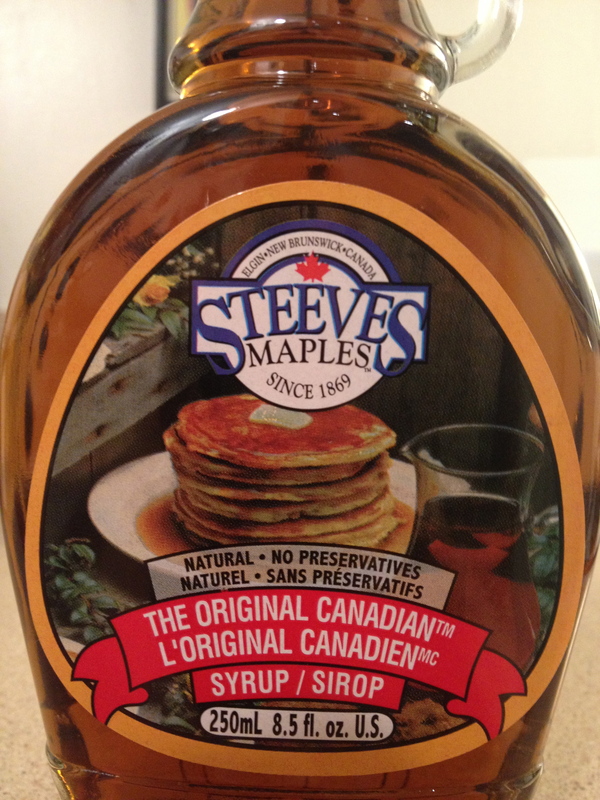 Who doesn’t love a bit of maple syrup? The indigenous people of the Americas were the first to harvest maple sap. One legend credits the humble squirrel with its discovery, telling of a young boy who watched a red squirrel nip at the bark of a maple tree and lap up the sap. How cute is that?! I love squirrels and I’m well willing to believe it. My husband came home from work recently, deeply enamoured of some maple syrup cookies, an office treat from a workmate’s holiday in Canada. 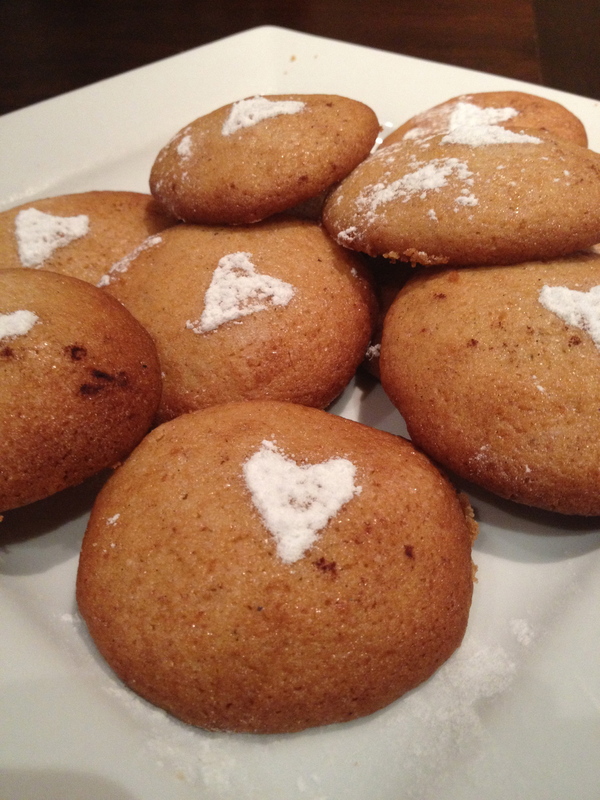 Not one to be outdone by holiday biscuits, I decided to rise to the challenge of making some maple cookies of my own. I based my biscuits on this lovely recipe, with the addition of some spices as I fancied a little kick. 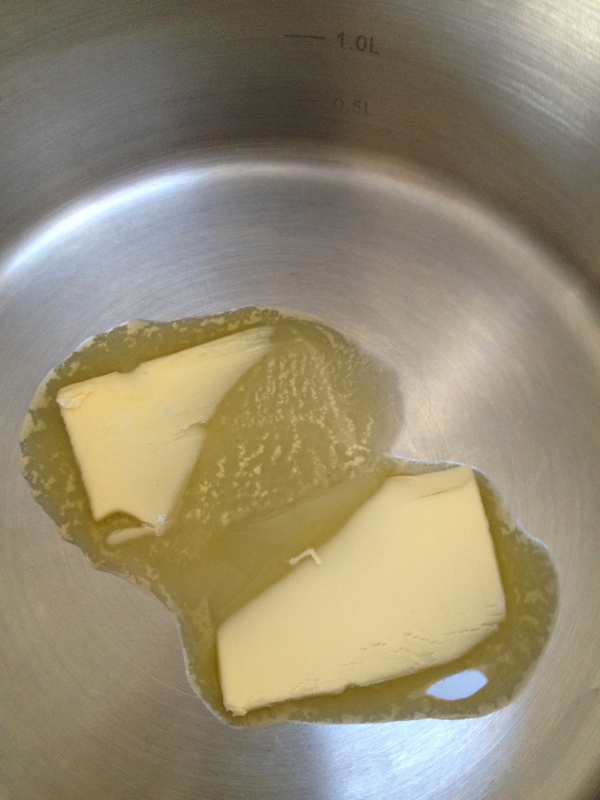 Begin by melting the butter and once melted, mix in the sugar and leave it to cool. Melt the butter in a reasonably-sized pot, as the beauty of this recipe is you can make the whole lot in this one pot. And what’s not to love about less washing-up? Once the butter and sugar are cool, add the egg and mix in. Follow with the maple syrup and the vanilla. Sift in the flour, salt, baking powder and spices and mix to combine. This will leave you with quite a gloopy mixture (as demonstrated below). Do not panic! It now goes into your fridge for at least an hour to chill. Set your oven to 180 degrees during this time. 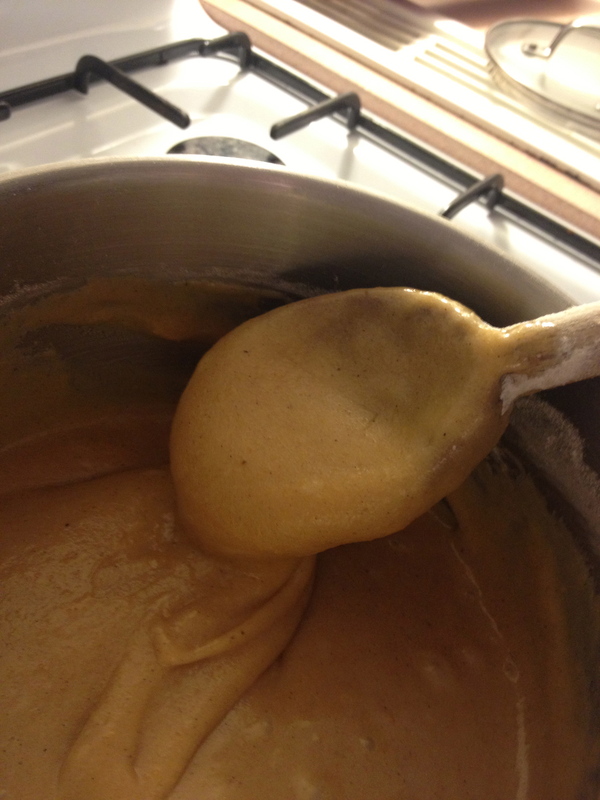 Once chilled, scoop teaspoonfuls of the mixture onto a greased baking tray. The mixture is quite pliable and you can easily shape the biscuits with your fingers. Sprinkle with some caster sugar and a little cinnamon if you fancy. Bake them until golden, about 10-12 minutes in my oven, and transfer to a rack to cool. 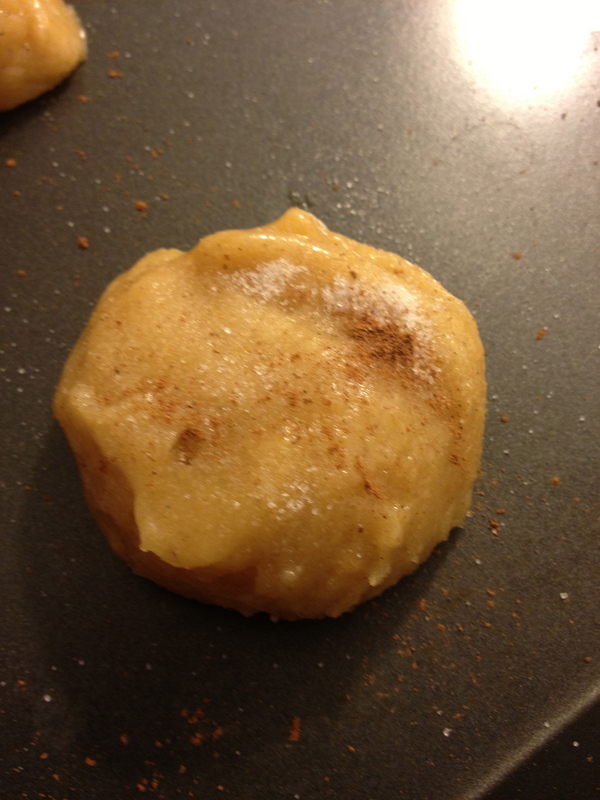 The mixture makes about 36, if you use teaspoon-sized dollops of the raw dough. 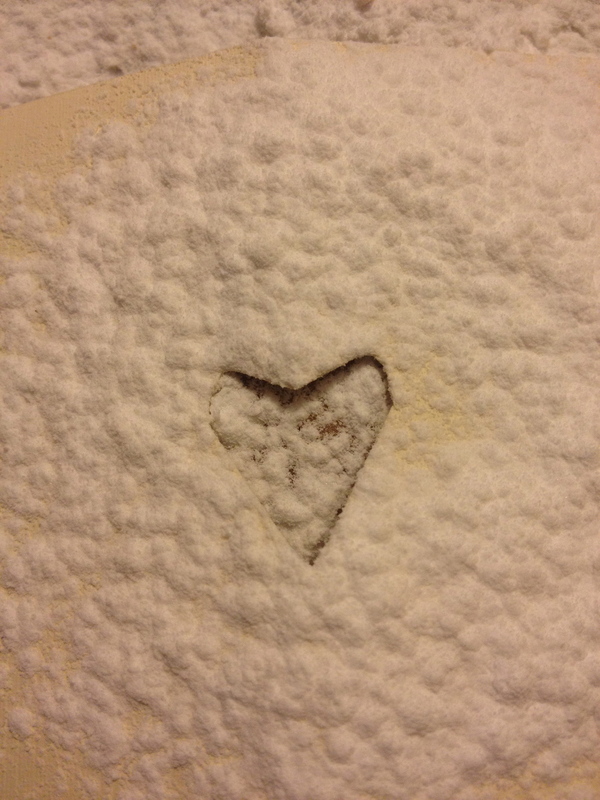 Because I was feeling creative, I topped mine with a little heart-shaped dusting of icing sugar….pretty easy to do, although I warn you, the icing sugar gets everywhere. If you wish to try this at home (although I understand if you cannot be bothered), I simply cut the shape out of a piece of stiff cardboard slightly larger than biscuit size, placed the cardboard over the biscuit, and sifted on the icing sugar. 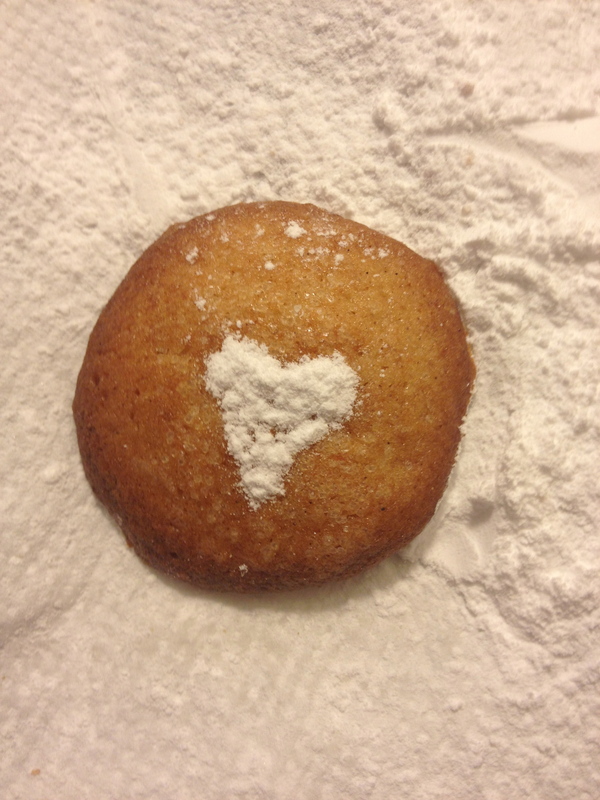 Remove the cardboard and there you have it, a cute little heart plonked on your biscuit. These go down nicely with a cup of tea! Forgive me readers, but I’m going to take a small detour through the Edmonds Cookbook index. Hot on the heels of Almond Biscuits is Almond Icing (yes, there are indeed a lot of almond-based recipes in the Edmonds Cookbook, and they’re not going away any time soon). For those of you familiar with Christmas Cake, and I can only imagine that is all of you, you will be acquainted with Almond Icing, which is the thick layer of gluey white sugary substance plastered on the top of your cake. If you come from my family, the almond icing will also be adorned with some plastic holly and a slightly inebriated-looking Father Christmas on a sleigh with some of his reindeer missing. It would be a terrible waste to make almond icing, only to have it sit around on its lonesome without a cake to call home. And so, with your good grace, readers, I will skip almond icing and revisit it when I reach the christmas cake section. Hopefully I manage to time this for Christmas. Next up, then, is Almond Rice. What is this fascinating dish?, I hear you ask. Almonds cut into rice-shaped pieces? Some kind of confetti to be thrown at weddings? 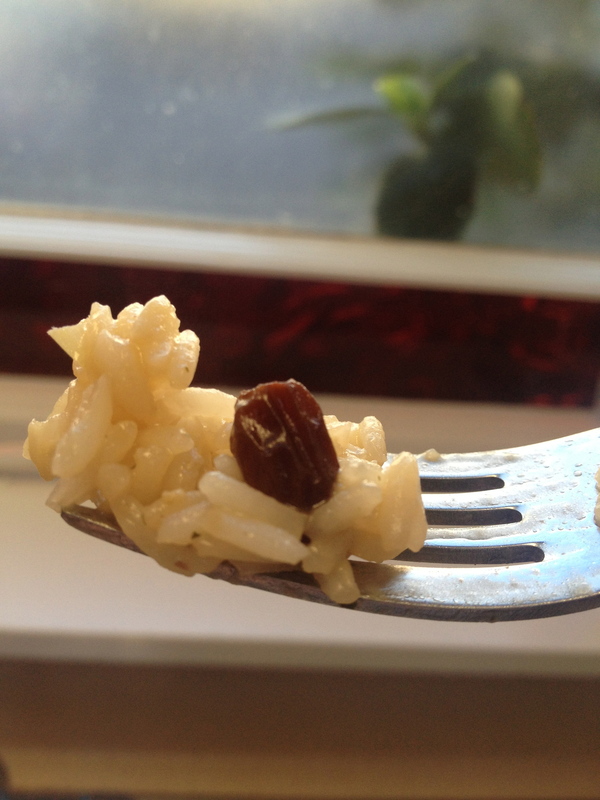 Almond rice is, in fact, a rice dish featuring not only almonds, but also raisins, butter, stock and of course rice. I’m not really sure of its origins. I would say that perhaps it is Edmonds’ answer to pilaf, however this already features in the mighty book. I remember something similar from childhood BBQs that also involved curry powder, so perhaps it is something of a simple retro classic. Ring any bells for anyone? One begins by melting the butter. I just love to watch butter melt. Yum. Add the garlic and onion and cook until the onion is clear. Is it just me, or is there something especially delicious about the smell of onion and garlic when they’re cooking in butter? Stir in raisins, stock, salt and pepper to taste. Cover and bring to the boil. Add the rice, reduce the heat and cook over a low heat for 15-20 minutes, until the rice is tender and the liquid is absorbed. 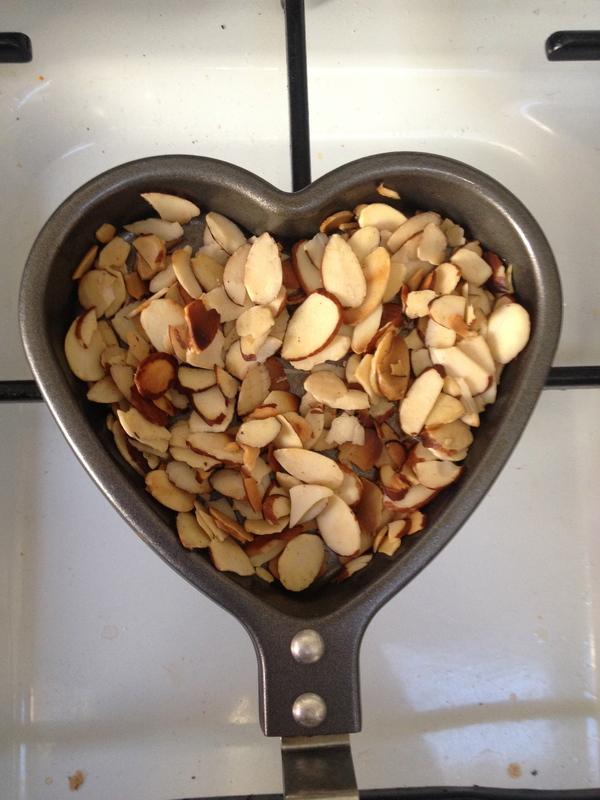 I made the most of this time by toasting my almond slices. Not wishing to dirty a big frying pan for only a small amount of almonds, I decided to use this cute little heart-shaped frying pan, the real purpose of which is to fry eggs with a little heart-shaped yolk. This was not the best idea I ever had as it was hard to stir them about and toast them evenly given the pan is small, so perhaps do not try this at home. But doesn’t it look cute? 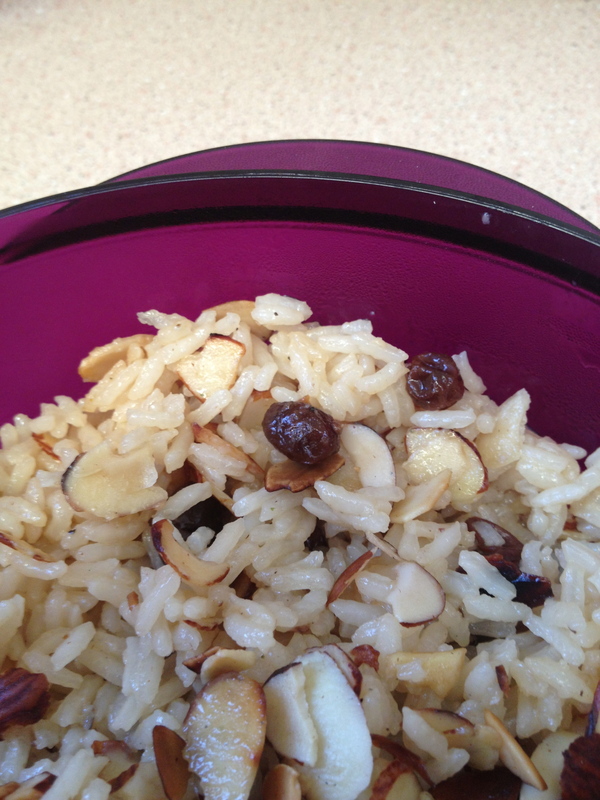 Once the rice is tender and the liquid absorbed, stir the mixture and add all but one tablespoon of your almonds. Edmonds now requires that one arranges the almond rice on a serving platter and garnishes with the remaining almonds. My plan was to eat this for lunch the following day, so you will just have to use your imagination with this picture of my almond rice in my lunch container. I did garnish it with the reserved almonds however. This was pretty tasty. Definitely worth cooking with the butter as this gives it a nice savoury note, and the little raisins plump up in the stock most pleasingly. The little rosette in the middle of my bok choy, depicted above, is not something you’d see in an exhibition-standard specimen. It indicates the plant in question has gone to seed. Far from being ashamed, I am absolutely delighted I kept something alive long enough for it to reach the gone to seed stage. 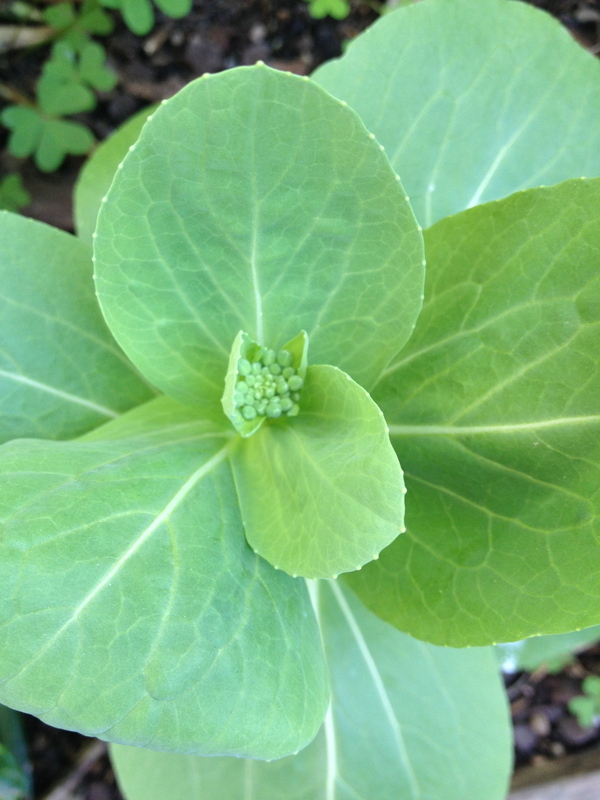 I am not the only creature in my neighbourhood who seems to enjoy bok choy, given the amount of nibbling something was doing on my hapless plants, risking the very existence of this blog post. Luckily, my third ever gardening-related purchase saved the day. 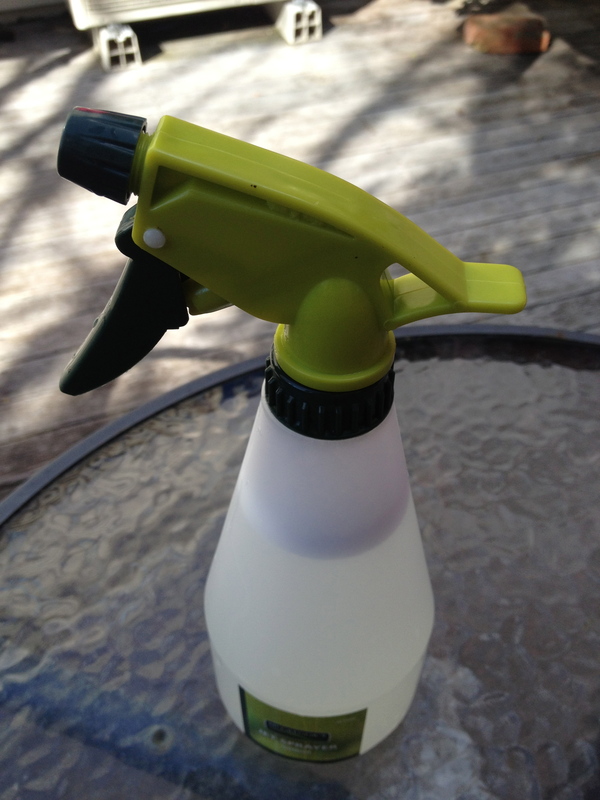 This little spray bottle below (which happened to be gift-wrapped in cellophane and metallic pink ribbon for Father’s Day – apologies readers, I did not think to capture this image) filled with a blend of dishwashing liquid, warm water and baking soda put a stop to the nibblers. There you have it, a hot gardening tip for you all along with my ramblings about food. 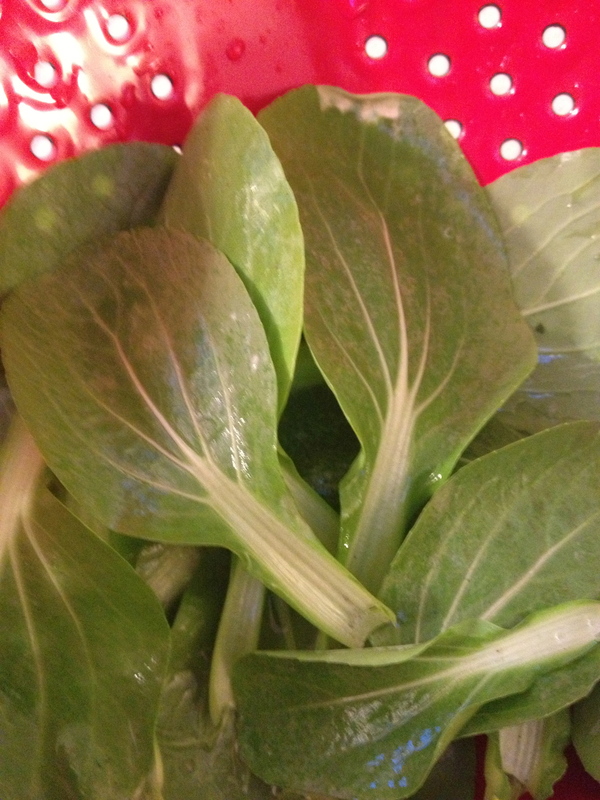 The bok choy one buys in a shop tends to be robust and very leafy in my experience. My little crop of bok choy was much smaller in size. Good things come in small packages however – they were lovely and green and pretty when picked. I almost felt bad about eating them. It’s not surprising that the majority of recipes you might consider involving bok choy are Chinese in flavour. 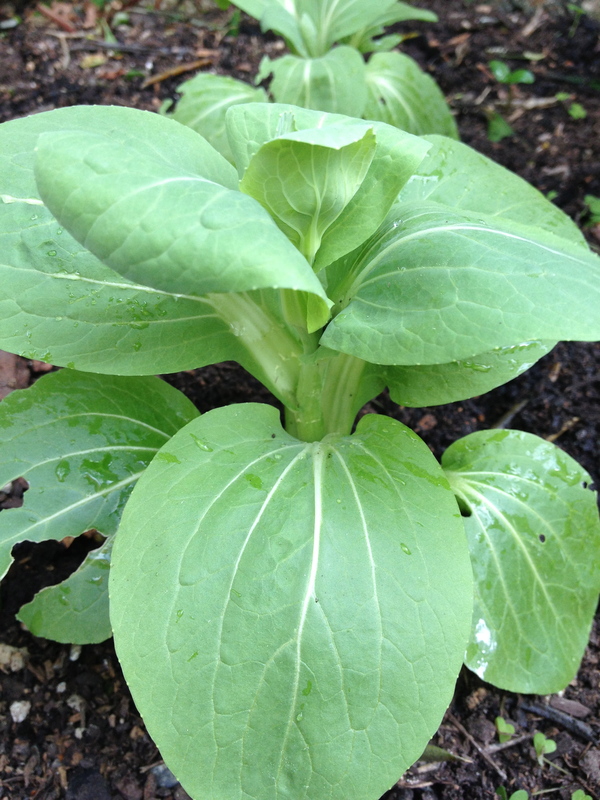 Bok choy, after all, hails from China and is even known as Chinese Cabbage by some. So, when it came to deciding how to treat my tiny little harvest, a simple combination of soy sauce, ginger and garlic seemed only natural, not wishing to drown the tender little leaves. 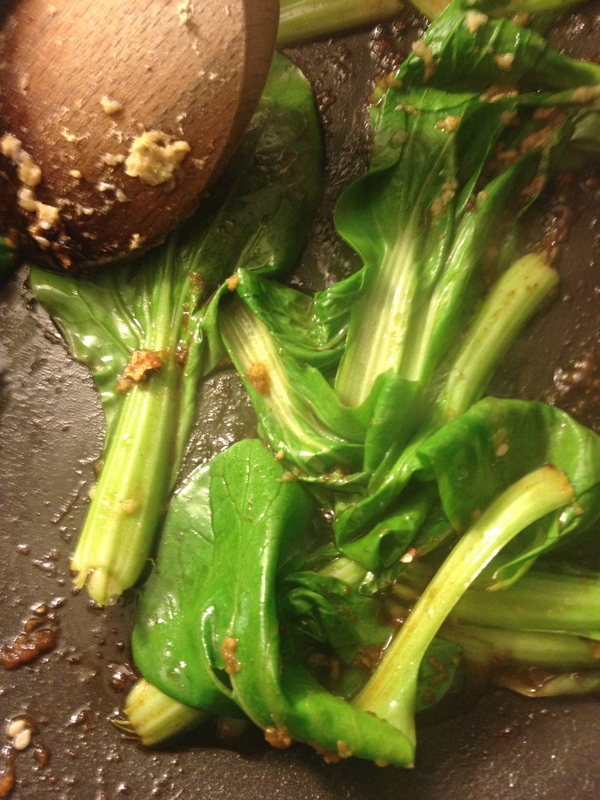 I gently stir-fried my bok choy in one sliced garlic clove, a tablespoon of grated ginger, a liberal sprinkling of soy sauce and a little vegetable oil. 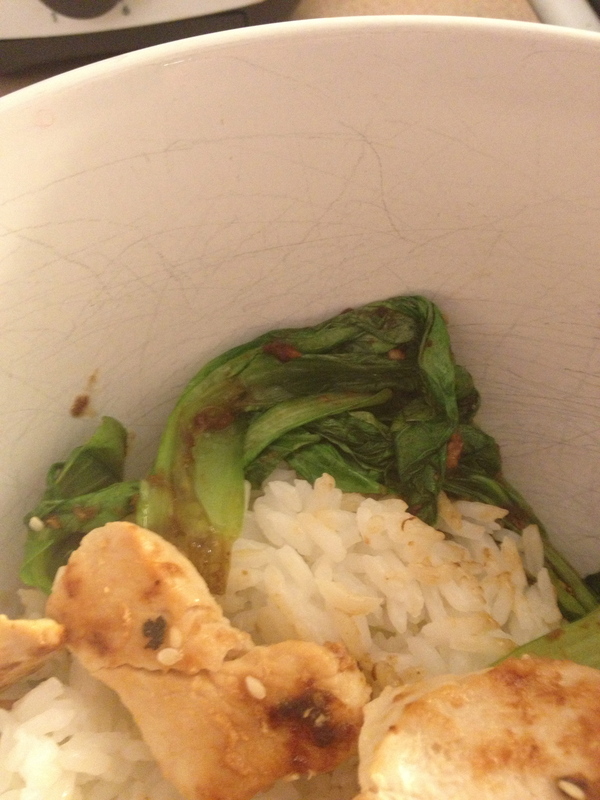 They were sweet and tender, and I gobbled them up from the top a large mound of jasmine rice, with a sprinkling of sesame seeds and some chicken with lemon juice.